Also serving communities of Motley. There are 3 Assisted Living Facilities in the Staples area, with 2 in Staples and 1 nearby. Caring.com has helped thousands of families find high-quality senior care. To speak with one of our Family Advisors about assisted living options and costs in Staples, call (855) 863-8283. Staples, Minnesota is a small city named for two famous men in the lumber industry and built on hard work centered around the town's sawmill. Today, the town is known for it's thriving arts community and home base for large companies. The population is about 3,000 and the median age is 42. There are seven assisted living facilities in the Staples area. Two of these are located within Staples itself, while the others are located in nearby cities. In Staples, as well as in the state of Minnesota, assisted living facilities are regulated by the Minnesota Department of Health which enforces a strict set of standards for living conditions. The cost of living in Staples is 13 percent lower than the Minnesota average and 15 percent lower than the national average. Seniors living in the area may find goods and services are cheaper than they are in other, bigger cities. The crime rate in Staples is ten percent lower than the national average. This makes Staples a statistically safe town, which may make some seniors here feel more secure. The Staples area is home to world-class medical facilities, including the Lakewood Health System, in the event of medical emergencies or illness. only in the mid- to low-20s. Many months also see very high levels of precipitation, with the summer months getting almost 10 inches of rain on average. The air quality index in Staples is 41 percent better than the national average, with a pollution index that is 78 percent better than the rest of the country. This means that seniors with respiratory illnesses can find more relief here than they would in bigger cities. Todd County Senior Services provides transportation options to seniors living in Staples. They offer many different ways for seniors to not only get from point A to point B to help them to connect with their community and enrich their social lives. Assisted Living costs in Staples start around $0 per month on average, while the nationwide average cost of assisted living is $4,000 per month, according to the latest figures from Genworth’s Cost of Care Survey. It’s important to note that assisted living rates in Staples and the surrounding suburbs can vary widely based on factors such as location, the level of care needed, apartment size and the types of amenities offered at each community. 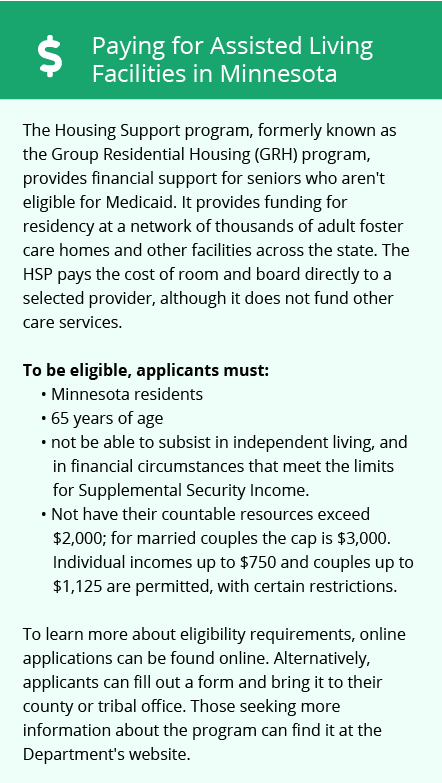 Eligible seniors can apply for financial assistance for assisted living in Minnesota via programs like Minnesota Medicaid. Medicaid provides support through several different waivers and programs, such as the Elderly Waiver, which may help pay for care and assisted living. 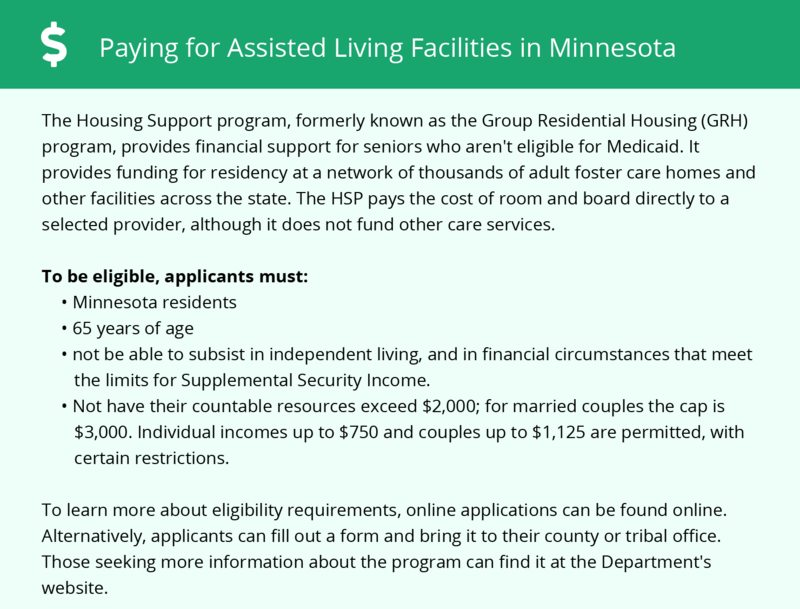 Qualified seniors may also receive assistance from state programs like the Minnesota Consumer Support Grant (CSG). Staples and the surrounding area are home to numerous government agencies and non-profit organizations offering help for seniors searching for or currently residing in an assisted living community. These organizations can also provide assistance in a number of other eldercare services such as geriatric care management, elder law advice, estate planning, finding home care and health and wellness programs. To see a list of free assisted living resources in Staples, please visit our Assisted Living in Minnesota page. Staples-area assisted living communities must adhere to the comprehensive set of state laws and regulations that all assisted living communities in Minnesota are required to follow. Visit our Assisted Living in Minnesota page for more information about these laws.